en:Leonora O’Reilly (1870 - 1927) was an American feminist, suffragist, and trade union organizer. 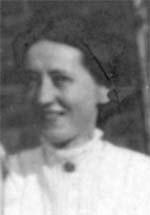 She was a founding member of the en:Women's Trade Union League. attuale 14:40, 6 apr 2007 150 × 215 (3 KB) Haus '''Leonora O’Reilly''' (1870 - 1927) was an American feminist, suffragist, and trade union organizer. She was a founding member of the Women's Trade Union League. From page:http://www.thelaborsite.com/women1.